On the road, everyone is in charge of each other’s safety. You drive well so that you stay safe but also so you don’t endanger anyone else either. What if you were driving and your car was struck by an unsecured load? Imagine the cost of property damage, and possibly the cost of life in extreme cases. This is why properly securing cargo is so vitally important in safe transportation. Steel tarps are just one part of road safety. Steel tarps are commonly made of either PVC-coated polyester or vinyl coated polyester. 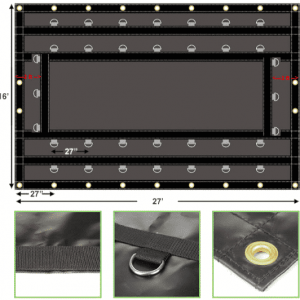 These tarps have stainless steel d rings sewn into the material. This helps with securing loads. Steel tarps are commonly used to secure steel, which is obviously where it got its name. Often it finds use in securing and protecting steel cables, rods or sheets. Because flatbed steel tarps are designed to contain such heavy materials, it is usually made out of a heavy-weight material itself. This is because if there is a failure while transporting steel, there can be terrible consequences. Here are just a few advantages of using steel tarps. Steel tarps are comparably lightweight and easy to handle. They can be used at construction sites to cover tools, cars, and even buildings. Steel tarps can be double fastened. This advantage can increase safety when they are being used to cover heavy cargo. Weather and UV rays are not an issue when using steel tarp. They are very stable in adverse weather conditions and will not become tough to work with or brittle in the cold. The size of steel tarps allows for the use of only one. This also helps improve safety in transportation because there is no need to use multiple tarps. It’s no wonder that steel tarps have found use in so many industries. Steel tarps are being used by many people. Here is just a small selection of uses for steel tarp. Trucking – Steel tarps are typically built with the size of a flatbed truck. This no coincidence of course. Steel tarp is meant to be used by truckers. It provides the perfect solution for fastening and protecting precious cargo. The double fastening design provides a bit more safety when strapping down a load. And the weather resistance helps to protect cargo from the sun’s rays and inclement weather. Because steel tarps are also made of one large piece of material, only one is needed to secure the load of a flatbed trailer. Construction – Many construction companies choose to keep steel tarps around. It’s the perfect solution for covering expensive tools, or even parts of buildings. The weather-proof and UV protective nature of steel tarps make the perfect combination for protecting your work site. Steel tarps at the home – Many people choose to keep a steel tarp around the house because it so useful for hobbyist whose hobbies take them outside. Steel tarps are the perfect choice for covering your boat or classic car. Some even choose to use it in the garden or to cover other outdoor projects. While steel tarp is a very heavy duty material, there are times where you will find small tears or other damage. This is known to happen to even the most tough materials and shouldn’t be a cause for concern. Steel tarps can be repaired very easily. All you’ll need is a section that you can patch with. This may be an old tarp, or you can choose to buy a repair kit. You’ll want to cut a patch slightly bigger than the size of your tear. Place your steel tarp upside down on a smooth surface. Apply a thick layer of adhesive on the underside of the steel tarp and place the patch over the tear. Use a roller to smooth out the patch on the tarp. This will remove any air bubbles that may have formed when placing your patch. Once you’re satisfied, leave the tarp to dry for at least three hours. Repairing your steel tarp can help you keep it for a very long time. This will help save you money in the long run. Cleaning a steel tarp is another important part of owning one. Regular cleaning and inspections will help you prolong the life of your steel tarp. It is recommended to clean your steel tarp at least twice a year. This will help remove mold, mildew, grime and dirt that can accumulate though its use. Simply use soap and water to clean your tarp. A push broom is all that is needed to brush down your tarp. It is important to not use any cleaners that are stronger than soap and water because it can degrade the steel tarps protective coating. 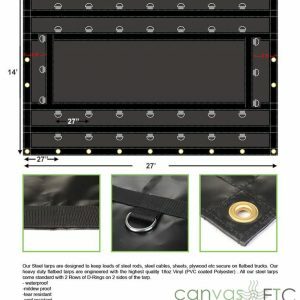 If you’re in need of a steel tarp, look to Canvas Etc’s website. We have a selection of steel tarps that can work for you and are always willing to work with customers to meet their needs.